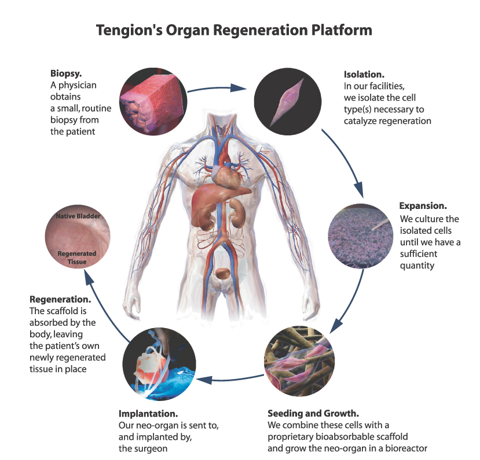 No narrative about the commercialization efforts of regenerative medicine would be complete without the story of Tengion (TNGN). It represents a business school-caliber case study about the risks inherent in bringing a novel medical product to market, even with an impressive pedigree, best-in-class technology, a colossal market opportunity, financial support from seasoned institutional investors and experienced personnel. Through the second quarter of this year, TNGN boasts an accumulated deficit of ~$265M, no products even remotely close to gaining regulatory clearance anywhere in the world and IPO shares that have lost 99.9% of their value in only three and a half years. The educational value of TNGN's history to biotech investors is infinitely greater than any success story could ever hope to be. It deserves a thorough analysis. Let's see what happened. Tengion commenced operations on July 10, 2003. The company was formed as a vehicle to commercialize the pioneering work in regenerative medicine that began at Boston Children's Hospital and MIT led by Dr. Anthony Atala. Dr. Atala subsequently moved to Winston-Salem, NC, where he is the Director of the Wake Forest Institute of Regenerative Medicine (WFIRM), a global leader in this emerging field. He is an internationally known figure because of his numerous TED presentations and WFIRM's impressive list of innovations in the field of tissue engineering. Dr. Atala is best known for successfully augmenting malfunctioning bladders in seven pediatric patients with reengineered tissues grown from the patients' own cells. The procedures, called cystoplasties, were performed between 1998 and 2001. I wrote about this trial in some detail in my regenerative medicine article and included a link to the April 2006 Lancet publication that generated much of the global awareness. It was a stupendous proof-of-concept of using a patient's own cells to manufacture replacement tissues and organs. The subsequent media attention energized tissue engineering research worldwide. Dr. Atala became, arguably, the most famous face in regenerative medicine. In October 2003, the Company licensed the tissue engineering-related IP from Children's Medical Center Corporation (out-licensing legal entity for Boston Children's Hospital) on an exclusive worldwide basis. In January 2006, the Company licensed additional tissue engineering-related IP from Wake Forest University Health Sciences (legal entity similar to CMCC) related to improvements in certain inventions and patents developed by Dr. Atala's team at WFIRM. This was also granted on a worldwide exclusive basis. Also in January 2006, TNGN formalized a 5-year sponsored research agreement with WFUHS in exchange for quarterly payments. Dr. Atala's team would be conducting the research at WFIRM. These contracts provided TNGN with a broad moat around its business as well as secured the research services of the most experienced and talented tissue engineering team in the world. Our Organ Regeneration Platform is based on extensive work that began in the early 1990s at Children's Hospital Boston and Massachusetts Institute of Technology, and continued at the Wake Forest Institute for Regenerative Medicine and our company. Our proprietary approach involves the use of a combinatorial method, testing different combinations of cell type and scaffold material. We believe this approach enables us to accurately identify the combination of various cell types and scaffold materials for a specific organ necessary to elicit a regenerative response and guides our decisions for subsequent rounds of testing. We own or license over 30 U.S. patents and patent applications and over 100 international patents and filings related to our Organ Regeneration Platform and product candidates. The value proposition of the platform is shorter product development times and simpler manufacturing techniques. 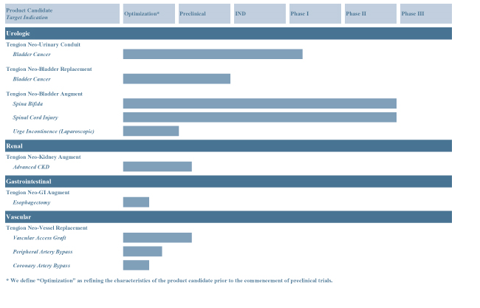 For example, TNGN has developed some product candidates from the proof-of-concept stage to first-in-man clinical trials in as little as 24 months. Also, the manufacturing process for the Neo-Urinary Conduit (NUC) has been reduced 50% (one month) by virtue of using smooth muscle cells obtained from a routine fat biopsy. This eliminates the need for urothelial cells and therefore eliminates the need for the more invasive and riskier full-thickness bladder biopsy. Isolation and expansion of progenitor cells. Cells are obtained via biopsy, then grown and expanded into the necessary cell types in a proprietary process. Seeding and growth. Cell populations are placed on a bioabsorbable scaffold and then incubated in a bioreactor to enable rapid growth into cellular and tissue layers. Implantation. The neo-organ or neo-tissue is shipped overnight to the implanting surgeon who has been previously trained on the correct implanting procedure. Regeneration. The neo-tissue serves as a template for the patient's body to regenerate native-like organs and tissues, including the necessary vascularization to fully absorb/incorporate the implant and scaffold. Rapidly advance its lead product candidate, the Neo-Urinary Conduit, through the regulatory process. Leverage the Organ Regeneration Platform to develop new products. Become a fully integrated company that develops, manufactures and commercializes neo-tissues and neo-organs. Selectively pursue strategic partnerships in order to accelerate the product development process and maximize the product's value while preserving significant commercial rights. If you compare the pipeline graphic with the strategy, however, you will notice a disparity that provides an early signal that something is amiss. The graphic shows the Neo-Bladder Augment (NBA) in late PII clinicals. This makes TNGN's situation appear much more attractive to IPO investors because this is the typical point when a clinical-stage company floats stock because of the common expectation that the additional capital will be used to fund PIII clinicals and the product's eventual commercial launch. The story line is that a successful IPO will enable the Company to push the product over the finish line, robust sales and profits will roll in, the share price will skyrocket and IPO investors can all retire early. Where is the NBA in the strategy then? It is conspicuously absent, isn't it? TNGN states that the NUC is the lead product despite being in early PI. The NBA is nowhere to be found. The reason for this is that there were problems in the PII and TNGN had no intention of progressing into PIII. Today, for example, TNGN does not even list the NBA in its product pipeline. This is an unfortunate case of disingenuity by both TNGN and the lead underwriters. I am quite sure that many IPO buyers took the graphic at face value when they were assessing the merits of the investment. I'll address the NBA PII problems in more detail later. The commercial opportunity for every product in the pipeline is, at least on paper, tremendous. Tissues and organs engineered with the patients' own cells is, by itself, a colossal improvement over current interventions. There is no need for immunosuppressant drugs and there are no deleterious side effects from the compromises that surgeons have to make in situations that offer few if any attractive quality-of-life options to the patient. 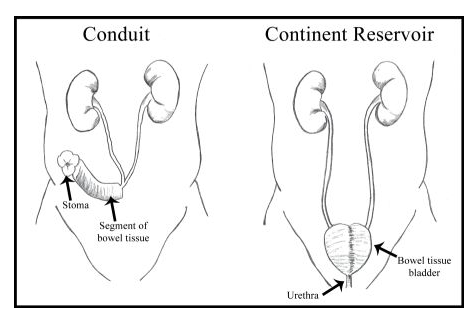 For example, when a cystectomy (bladder removal) is performed, the surgeon only has two choices for urinary diversion, a conduit or tube that diverts the urine through a hole in the abdominal wall called a stoma or a continent reservoir (replacement bladder). The surgeon constructs both of these structures from the patient's small intestine (ileum). Removing part of the bowel causes problems such as post-surgery loss of function, obstructions, leaks and fistulas (abnormal connection), malabsorption of salts, lipids and vitamin B12 and diarrhea. Intestinal tissue also secretes mucous. This increases the viscosity of the urine and results in more frequent reservoir irrigation and catheterization procedures. If this were not enough, conduit patients endure an ever-present risk of infection at the stoma plus the morbidity-eroding need to wear an ostomy bag. The NUC and Neo-Bladder Replacement (NBR) both obviate the need for bowel surgery. This is a profound improvement by itself, but they both offer the advantage of being urinary system tissues thereby avoiding the disadvantages of using part of the intestine for urine conveyance. Neo-Urinary Conduit. In the U.S., there are ~13,000 urinary diversion procedures performed annually. Per the Company's research, payers state that $40k/conduit is reasonable. The total potential domestic market is, therefore, $520M. Europe and Asia are roughly the same size so the global potential market would be ~$1.5B. 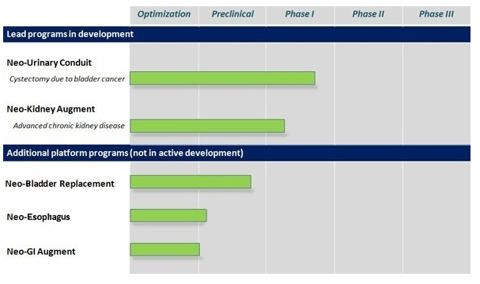 If TNGN could capture 20% of the potential procedures, it would translate into an available global market of ~$300M. Neo-Kidney Augment. In the U.S., there are 26M patients with chronic kidney disease. There are 350k patients currently on dialysis with 100k new patients added each year; the disease has a 20% mortality rate. There are 18,000 kidney transplants/year at a cost of $100k/transplant plus $30k/year for immunosuppressant drugs. A total of $39B is spent/year to treat End Stage Renal Disease including $77k/year for each dialysis patient. Modeling the dialysis population results in a steady state group of ~500k in ten years. Assume that the dialysis population is the target market. Further assume that the NKA will delay the onset of dialysis for a minimum of one year so a reasonable prospective unit price would be $80k. The potential domestic market would be ~$4B. Capturing 20% would imply an available U.S. market of $800M. The available global market would be, again, ~$2.4B. Neo-Bladder Replacement. Approximately 30,000 cystectomies are performed each year in the U.S. and Europe. Since the NBR represents a significantly better morbidity option than a conduit, assume a unit price of $80k. The potential Western market would be $2.4B, adding Asia would expand it to ~$3.6B. Again assuming a 20% share, the available global market would be ~$700M. This market opportunity is not incremental to the NUC market. It should cannibalize it considering its significant advantages. Over time, you would expect the conduit market to shrink to near zero if the NBR was widely available. All together, my back-of-the-envelope calculations imply a global opportunity of ~$3B for these products. In August 2004 the company issued Series A Convertible Preferred Stock that netted $30.1M in cash proceeds. In March 2005, it issued more Series A netting $5.2M. In June 2006, it issued Series B CPS netting $50M. In September 2007, it issued Series C CPS netting $33.2M. In October 2008, it issued another round of Series C netting $21.4M. The total amount of capital raised was $139.9M. Eight institutional investors owned 78.2% of these shares. Seven were beneficial owners (>=5% stakes). Oak Investment Partners, the venture capital subsidiary of Johnson & Johnson and Bain Capital headed the list. The beneficial owners were all sophisticated seasoned biotech investors. Their commitment provided substantial credibility to the TNGN story. The Chairman of the Board and co-founder of the company was the founder and CEO of a biotech advisory firm for ~30 years. He was a director of at least six biotech companies including ViroPharma and Achillion Pharmaceuticals. He earned his undergraduate degree from Harvard and his masters from Yale. In August 2004, he added a venture capitalist as his first board member. At the time of the IPO, he had 10 years experience, including CEO roles at multiple early stage companies. He earned his MD from Karolinska Institute in Sweden and his PhD in neurobiology from Harvard Medical School. Karolinska is a leading regenerative medicine institution. As I stated in my HART article, this is where Dr. Macchiarini performed most of his trachea transplant surgeries. In June 2006, two more directors were hired. One was a founder of a venture capital firm with seven years experience who had served on the boards of over twenty biopharmaceutical firms. She had both a DVM and MBA degree. The other was a managing director at Bain Capital for ten years. Prior to that, he was a partner at McKinsey. He earned his BA at Yale and MBA at Harvard BS. In February 2008, a fifth director was hired. He was a financial consultant who had previous CFO experience in numerous biotech firms. At his time of hire, he served on the board of three biotech companies. In October 2008, the sixth director was hired. He was also affiliated with a biotech venture capital group. He had more than eighteen years experience in operations and investments. He was a lecturer at the Wharton School, University of Pennsylvania. He earned his BS from Stanford and his MD from Washington University. In April 2004, TNGN hired Steven Nichtberger, MD, as its CEO. He had over fifteen years of executive experience, most recently as head of Global Marketing at Merck. He also had entrepreneurial experience founding a private company that licensed IP. In August 2004, a CTO was hired. He sported DVM and PhD degrees and had over 10 years industry experience. In October 2004, a CFO was hired. She had over twenty years experience, including senior positions at Merck. She earned her MBA at Duke University. In November 2004, the head of R&D was hired. He had over twenty-seven years experience. This was the core leadership team for several years. Six more executives were brought on board beginning in 2006. In January, a regulatory expert was hired with fifteen years experience. In January 2007, a PhD was hired as VP of Regenerative Medicine. She had nine years industry experience, most recently with Becton-Dickinson. In August 2008, a Chief Commercial Officer was hired after thirteen years at Merck. He earned his MBA at Wharton. In 2009, a VP of Quality, Corporate Counsel and Director of Operations were added, the last in September, with industry experience of twenty-five, ten and fifteen years, respectively. All of the board members and executives had substantial relevant experience and successful track records. No one appeared under-qualified for their job responsibilities. The quality of the five broad areas of TNGN's business appears nearly flawless. The technology is leading edge and seemingly performs as promised, it is securely protected by patents and licenses, the market opportunity is gargantuan, leading institutional investors are on board and the executive team is experienced and well-qualified. What's not to like? If there was ever a "sure thing" in biotech, this was it. The "multi-billion dollar valuation" cliché that retail investors hear so often actually appeared not only possible, but probable. Let's look at what happened as the company attempted to develop its business. Initially, TNGN's lead product was the Neo-Bladder Augment (NBA). This makes intuitive sense because this was the product developed and successfully implanted in seven patients by Dr. Atala. The product performed well by all measures and every patient enjoyed significantly improved morbidity during the follow up period, which was from ~two to five years. This Phase I trial could not have gone better. It provided a superb foundation from which to begin the formal commercialization process. In December 2006, TNGN initiated a Phase II trial for the NBA. It targeted pediatric patients between the ages of three and sixteen who suffered from spina bifida. Ten patients were to be implanted. The primary endpoint was a statistically significant (p-value < .05) positive change in bladder compliance at maximum capacity at twelve months, compared to the pre-implantation baseline value. Compliance was defined as the ratio of bladder volume ((mm)) to bladder pressure (cm of water). In December 2009, TNGN received the final data from the trial. The average increase was 1.6 mm/cm of water or 48%. The p-values were .1 and .006, respectively. The second metric passed the test, the first did not. One of the criteria for inclusion into this clinical trial was the ability of patients to cycle, or fill, hold and evacuate urine in their bladder. Cycling is necessary to develop compliant bladder tissue and the process represents the natural series of events that, if interrupted, can lead to a hypertonic, or high tension, and shrunken bladder. In this trial, only 6 out of the 10 patients were able to cycle. All six of these patients had improved outcomes and were identified as responders by clinical investigators at the 12 month assessment; two of these six patients, however, subsequently experienced serious adverse events as described below. These serious adverse events adversely affected the clinical improvement of both of these patients. Four out of the 10 patients were determined, after inclusion into our trial, to be unable to cycle for reasons we have identified. All four of these patients were identified as non-responders by clinical investigators. Based on this experience, we believe we will be able to exclude those patients who are unable to cycle from future trials for our Neo-Bladder Augment. While measurements such as compliance and pressure were chosen as the primary means of assessing efficacy in these trials, the primary endpoint did not correlate to clinical response as identified by the investigators. We designed these trials to be exploratory and, thus, we collected multiple additional parameters to evaluate the efficacy of our product candidates, including radiographic studies, and functional capacity and continence as reported by each patient in a voiding volume diary. The clinical investigators provided us with assessments of each patient's functional bladder capacity in relation to his or her daily activities and their clinical assessment of the patient and the patient's satisfaction after receiving our Neo-Bladder Augment. Based on this experience, we are considering the use of a more clinically meaningful endpoint than compliance at maximum capacity in future trials. We will be required to submit a study protocol to the FDA for its approval before beginning a Phase III trial. Three patients in our Phase II clinical trials experienced serious adverse events that, at the time of their occurrence, were deemed by the respective clinical investigator to be clinically relevant and probably related to our product candidate or the implantation procedure. In February 2009, the FDA placed our IND on clinical hold. In July 2009, the FDA released the clinical hold with no recommended changes to our protocol, product candidate or implantation procedure. Two of the serious adverse events involved pediatric patients, both of whom experienced small bowel obstructions and one of whom also developed a bacterial infection in the wall of his bladder.Both of these patients experienced bladder perforation resulting in leakage through the bladder wall, following these initial complications. We conducted a thorough review of the safety events of these patients including the details of each event, the background medical history of these patients, the timing of the events relative to the implantation of our Neo-Bladder Augment and the background rate of bladder perforations in patients receiving the current standard of care, enterocystoplasty. We submitted a complete response to the clinical hold setting forth our analysis in June 2009 and the FDA released the clinical hold in July 2009. We also noted that bladder perforations, bowel obstructions and infections are known complications of enterocystoplasty, the current standard of care for patients with neurogenic bladder requiring bladder augmentation. The third serious adverse event, which occurred in October 2009, involved an adult patient who experienced a bladder perforation that occurred during a urodynamic evaluation being performed as part of our clinical study. A urodynamic evaluation involves the insertion of catheters into the bladder, which are then used to fill the bladder with fluid to assess its capacity. We have submitted a report of this serious adverse event to the FDA in November 2009, noting that this serious adverse event is not an unexpected complication for these patients undergoing urodynamic procedures. The patients experiencing the first and third serious adverse events have fully recovered medically. The patient experiencing the bacterial infection and who had the second serious adverse event continues, as of March 2010, to have an indwelling catheter but has otherwise recovered medically. In November 2007, a second Phase II trial began targeting adult patients between the ages of seventeen and forty-two who suffered from neurogenic bladder due to spinal cord injury. Six patients were to be implanted. The endpoint was the same as the first PII. Here is a statement concerning the trial's status from the prospectus (p 67): We have not yet received final data from this trial. This statement is a bit surprising considering the April 2010 date of the prospectus and the modest number of patients to be implanted. In the 2010 10-K, TNGN states that the enrollment for the adult PII was terminated due to enrollment challenges. It then makes the following statement (p 12) (bold type mine): In addition,we have seen limited efficacy of our Neo-Bladder Augment in patients.As of the 36-month clinical follow-up of our pediatric patients,three of the ten patients continue to demonstrate sustained clinical benefitfrom our product candidate.With respect to adult patients, as of the 24-month clinical follow-up, three of the six patients continue to demonstrate sustained clinical benefitfrom our product candidate. It appears that all of the six planned adult implantations did occur so I am unclear what the company means by "enrollment challenges." Also, TNGN had 24-month follow up data as of the end of 2010 so, by definition, it had 12-month follow up data at the end of 2009 (this was the primary endpoint). It appears that TNGN elected to sequester the 12-month data from the prospectus because it did not want to taint the product that was the furthest down the regulatory path. This looks like a deliberate attempt to mislead IPO investors and, consequently, does not reflect well on management. There's more. In June 2005, the company leased 38,400 sq.ft. of space in Winston-Salem for its pilot manufacturing operation and offices. There was plenty of room to manufacture all its products for all its clinical trials for years to come, although TNGN stated that it was designed to manufacture products through PII only. In 2006, it signed a ten-year non-cancelable lease for 45,000 sq.ft. of space in Pennsylvania. The lease included a provision to lease an additional 35,000 square feet in March 2011 for another non-cancelable term of ten years. Only 15,000 sq.ft. was earmarked for offices. The remaining 65,000 sq.ft. was earmarked for manufacturing PIII and commercially available products plus warehouse space. This is a colossal amount of real estate to commit to for a total of fifteen years. Management was clearly bullish on the NBA's prospects. In the 2010 10-K, though, it made the following statement (p 15): activities that were under way to prepare this facility to commence manufacturing operations were temporarily halted in March 2009. TNGN was mothballing its manufacturing operation 2 YEARS before its commitment on 35,000 sq.ft. of additional space even began. Clearly, the company realized in early 2009 that the NBA PIII was not going to happen, yet it neglected to update its product pipeline disclosures in the prospectus almost a year later. This one data point is a shining example of why retail investors have to do a thorough job of due diligence before deploying their hard-earned capital, especially in an IPO. The company's senior management, underwriters and institutional investors were all in on the cover up because, above all else, they had to get their money out. On page 12 of the 2010 10-K, I found the following statement: We currently are not actively developing our Neo-Bladder Augment and are directing the majority of our resources toward the development of our Neo-Urinary Conduit and Neo-Kidney Augment. We may, in the future, determine to terminate the trials involving our Neo-Bladder Augment, so as to further conserve our resources for use on our lead product candidates. It looks like the NBA might be dead. Here is a statement from the 2011 10-K (p 9): In April 2011, we terminated the pediatric and adult Neo-Bladder Augment clinical trials. We subsequently withdrew the IND. The NBA is officially dead. In May 2007, the license agreement with WFUHS was amended to include advancements Dr. Atala's team made in the tissue manufacturing process. They discovered that viable urinary tissue could be developed by harvesting and growing progenitor cells obtained via a routine adipose (fat) biopsy. Additionally, they discovered that only one type of cell was needed, smooth muscle, to seed the scaffold. The urothelial and submucosal layers develop in vivo after the conduit implantation (as demonstrated in animal models). This greatly simplified the manufacturing process. The time from biopsy to implantation was reduced 50% (one month) with a similar drop in costs. Also, a fat biopsy is a significantly easier and safer procedure compared to a full-thickness bladder biopsy. In animal studies, WFIRM observed no abnormal cell growth and complete mucosal lining at the ureteral and skin junctions, thus eliminating the risk of urine leakage into the body. These are bullish developments to be sure. My perception is that sometime in 2008, TNGN decided to make the NUC its lead product. In March 2010, a Phase I trial began at the University of Chicago. It was an open-label single arm study in up to five patients. The primary endpoint was conduit safety with a focus on the surgical procedure. A single center was chosen in order to minimize variations in the surgical technique. The secondary endpoint was efficacy, specifically the patency and structural integrity of the conduit. The primary assessment of safety and efficacy would be made twelve months post-implantation. Each patient would be followed for an additional forty-eight months to assess long-term conduit safety and durability. The company expected most of the implantations to be completed in 2010 despite the FDA-mandated eight-week observation period between the first three surgeries. The observation period would be reduced for the remaining procedures if the patients recovered uneventfully. On August 11, TNGN issued a press release disclosing that no patients had been enrolled in the trial despite screening dozens of candidates. It attributed the lack of progress to overly-stringent enrollment criteria. On September 9, it disclosed that Johns Hopkins had been added to the PI. On October 25, it announced the first implantation at the University of Chicago. On November 16, it announced the completion of the one-month clinical assessment of patient #1. This cleared the way to enroll the next candidate. The company expected to have all five patients implanted by mid-2011. On January 10, 2011 it announced an expansion of the inclusion criteria, an option to increase the clinical trial sites up to six and the maximum number of implantations up to ten. No new patients had been implanted. The company revised its forecast of completing five implantations to the end of the third quarter. On March 25, it announced that two more patients had been implanted. On May 12, it disclosed that there were problems with the three implantations and the availability of interim data on the five trial participants would be delayed until 2012. The issues were associated with stoma patency, conduit integrity and vascular supply. On June 13, it disclosed that it would be collecting additional data on the three patients and would be modifying the surgical approach. Clearly, the conduits were not performing well. The company provided no specific details about the issues. Fast forward to the 2012 10-K, though, and page seven contains this statement (bold type mine): Data from the first three of these patients allowed clinical investigators to design surgical modifications in an effort to address stoma patency, conduit integrity and vascular supply. The complications that arose with each of these patients were resolved successfully and,following new surgeries to construct a urinary diversion using bowel tissue, all three patients recovered well. The first three conduits failed. Each patient had to undergo the very procedure that the NUC was designed to replace. On November 14, 2011 TNGN announced a restructuring plan. As of today, only seven patients have been implanted with the NUC. Two of these have died, one from metastatic bladder cancer and the other from a heart attack. This means that TNGN will only be able to collect long-term data on a maximum of five patients. The company now expects to enroll the final three candidates by the end of this year. If successful in achieving this objective, the one-year assessment will occur in early 2015 and the five-year assessment will occur in early 2019. This will have been a NINE-YEAR Phase I trial for a product that initially looked like a "sure thing." NUC's clearance of the regulatory process is, under the bluest of blue-sky projections, at least ten years away. Both PII and PIII trials will require much larger patient cohorts. And don't forget that the NUC is TNGN's lead product. There is not a pinhole-sized ray of light at the end of the regulatory tunnel. The Neo-Kidney Augment and the Neo-Bladder Replacement are both early-stage products. A PI for the NKA for three to five patients is due to start in Sweden at the Krolinska University Hospital in Stockholm. A U.S. trial won't begin before mid-to-late 2014. It will have a duration similar to the NUC trial. The NBR's PI, at least in the U.S., is years away pending the collection of long-term NUC data. In my opinion, the IPO was merely an attempt by company insiders and institutional investors to pull in as much additional capital as possible before the true state of affairs became widely known. If the actual status of the NBA was disclosed, the IPO may not have been executable. Very few biotech firms can pull off a successful public offering when all of their product candidates are barely into Phase I clinicals. It's too early. They also had the futile hope that bullish investor sentiment about regenerative medicine would underpin the share price long enough for them to get their money out. Considering the light trading volume, I doubt they were successful. What could retail investors have done? As I mentioned earlier, the first clue that something was amiss was the exclusion of the NBA in TNGN's strategy despite being in late Phase II clinicals. This did not make sense. I would be willing to wager, though, that no more than five percent of investors who read the prospectus caught it. The loudest and clearest message that shareholders received was the immediate post-IPO price erosion. The offer price was $5. It closed at $5.08 on April 12, 2010, the first trading day. With the exception of two days in February 2011 it never closed above $5 again. Disciplined investors who had a predetermined exit point limiting their loss at 10% or less, saved a bundle. So what happened in February 2011 that made the price spike? According to TNGN's February 16 press release, it had to do with a rumored stock-for-stock merger. Here is its explanation for why the deal failed to materialize: As a result of the recent increases in the trading price and volume of Tengion's common stock, Tengion's potential acquirer has terminated merger negotiations. The next day, the share price returned to its pre-rumor level. Was the window of opportunity really this narrow? For those shareholders wearing rose-colored glasses, the other loud-and-clear "time to head for the hills" message was the CEO's resignation on June 30, 2011 for undisclosed reasons. Where did Dr. Nichtberger go? It seems that a board seat on a biotech industry trade association lured him away. He later assumed the CEO role at the radiology products firm, ControlRad Systems. So where do we go from here? Nowhere but the sidelines. There is a very real possibility that TNGN will have to declare bankruptcy if it is not acquired. Its funding sources have dried up and it faces ~$22M in debt obligations in the next two years that it has already kicked down the road several times. I doubt that it can be kicked again. For me, I'm going to keep a eye on TNGN because I want to keep track of where the licenses go. The technology is too promising to ignore or forget. It's just that it's premature. Like I said in my regenerative medicine article, it's going to be a long tough slog to break through the regulatory process. It will be many years before one of these products is commercially available for implanting in humans. And how about the much-ballyhooed ability to hit the "Print" button and get a new heart or pair of lungs? Hopefully, TNGN's story will inject some reality into the hype. The pot of gold is out there, but it is WAY out there. In the meantime, bullish investors should try to stay sober. Case memo question: Should Tengion prioritize Augment or Conduit as its lead product? This was a less complicated than the procedure of removing bowel tissue, but required a tissue biopsy and required an invasive procedure under general anesthesia. Production cost for Augment was around $15000 to $20000. FDA would give priority in approval to Augment an “orphan” status since the study population was small and involved mainly children. In contrast, production of Conduit required only a single needle extraction of healthy fat tissue. There were reduced chances of contamination and errors since it was a single stage manufacturing process as opposed to Augment’s two cell process. Manufacturing cost for Conduit was $10,000 which was cheaper than Augment. There were more patients available for clinical trial and easier endpoints to show to the FDA as compared to Augment. Also, partnership with Uro-oncologists would make FDA approval easy because of their experience in FDA clinical trials. Tengion was also highly optimistic about the clinical trial success of Conduit after its successful implantation in dog. Tissue implantation procedures showed greater equivalence across animals and humans as compared to drugs.